I just can't get enough of the comic based product at the moment, so much so I felt I needed to get two pieces in one outfit for a real comic print clash! 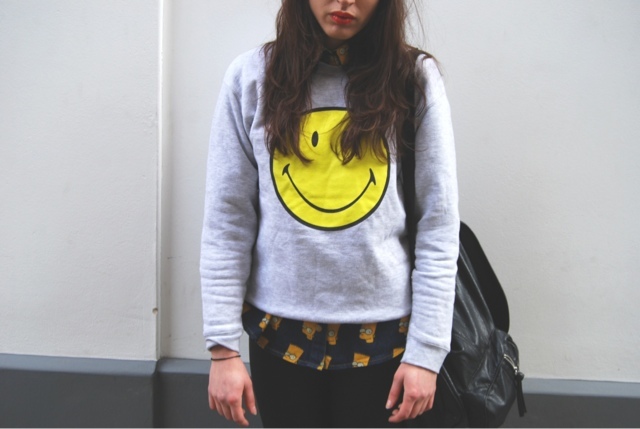 The smiley face sweatshirt is by Tee and Cake from Topshop where I'm sure most of you have seen the matching tee and leggings set, and bodycon dress with the same design. Where I feel like a sweatshirt and the motif are quite young, I decided to wear it with the Bart Simpson denim shirt from She Inside buttoned up to the top underneather and wetlook leggings (hate myself, but such a go to item) to mature the outfit rather than just chucking it on with jeans. You will possibly not purchase a pc sleeve, your going back pack louis vuitton replica sale or perhaps hi-end classy designer handbag in the popular save while in the supermarket. Having said that, upon an online website, all sorts with travelling bag louis vuitton replica sale is obtainable a little mouse click at a distance - whether it's your back pack, your clutch, your pc louis vuitton replica travelling bag or perhaps sling travelling bag. A charge card set up your investigation keyword and key phrase plus there are actually solutions in abundance perfect while in front of you actually out there. Internet browsing fake chanel to get shopping bags is indeed probably the greatest solutions for any young women to choose from who seem to do not possess a time and energy to jump within eight several suppliers to purchase a person left arm sweets. Thanks to the next few paragraphs, Sonam Sharma find out you actually pertaining to the perfect most popular baggage fake chanel for ladies around Asia. You may aslo obtain extra for hottest design for ladies during shopnineteen.